← 2013: Breakout Year for SUP? Obstacle racing gets more intense. These days, the market for all things endurance sports is flooded. No matter where you live, there are numerous opportunities to compete every weekend. In Florida, it’s impossible to find fewer than six endurance sports events within a 45-minute drive any weekend of the year, especially in 2013 with Christmas falling on a Wednesday. 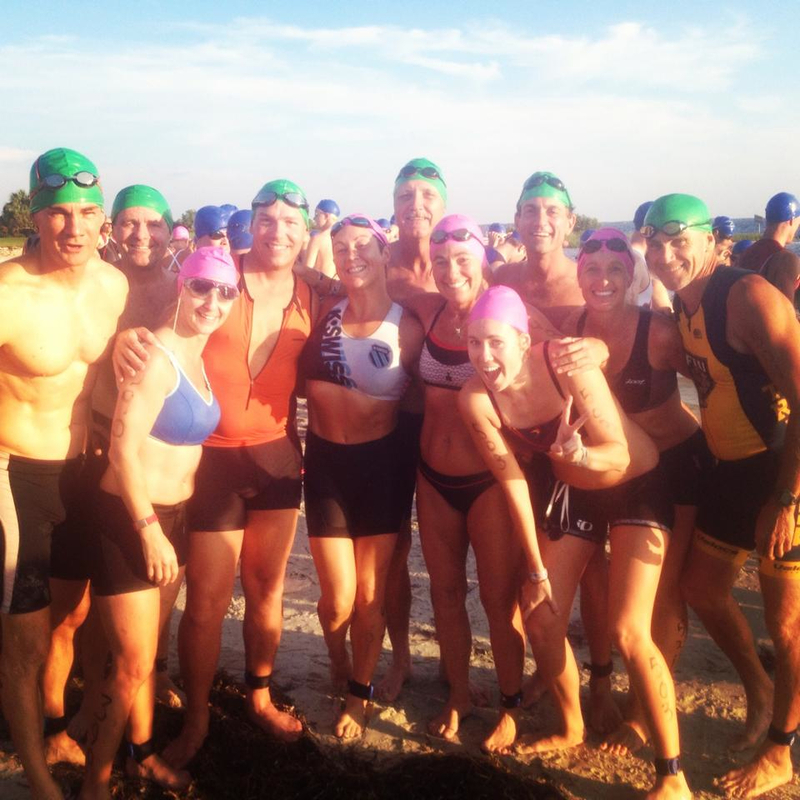 The Sunshine State remains the epicenter for all things endurance sports. The hub might be Benderson Park, a sprawling rowing/swimming/paddling/triathlon complex going up in stages in Sarasota. With that in mind, here are the top 9 stories/trends in the industry from 2013. No. 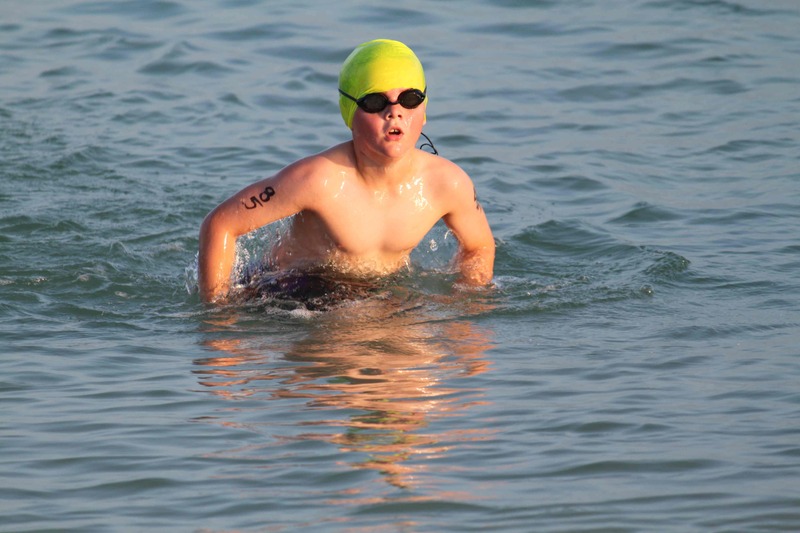 9 – OPEN WATER SWIMMING: These competitions have existed for years, but there’s suddenly increased interest. Maybe it’s because the roads have gotten crowded (and dangerous) with all of the runners and cyclists, to say nothing of motorists focused on their smart phones. Maybe it’s because swimmers are realizing it’s a lot more fun than training in the pool. Maybe it’s because competitive youth swimmers (above) discovered they can get out of the pool and beat 90 percent of adult recreational swimmers in open water. Maybe it’s because many triathletes didn’t learn to swim as adults and want to put their skills to use as often as possible. FLORIDA CONNECTION: Diana Nyad brought attention to open-water swimming in September by becoming the first to complete the treacherous Cuba-to-Key West swim without a shark cage. In January, 15-year-old Becca Mann won the Frogman Swim, the 5K trip in chilly waters from St. Pete to Tampa. Mann, now 16, hopes to reach the Olympics in 2016 in both open-water swimming and pool events. Anyone who has seen her train and compete for the Clearwater Aquatic Team knows this is a distinct possibility. No. 8 – LANCE ARMSTRONG CONFESSES: It seemed like such a foregone conclusion to all but his most ardent supporters that Lance Armstrong cheated his way to seven Tour de France victories that it’s easy to forget that his confession to Oprah Winfrey actually happened in 2013, back in January. It seems much longer ago. 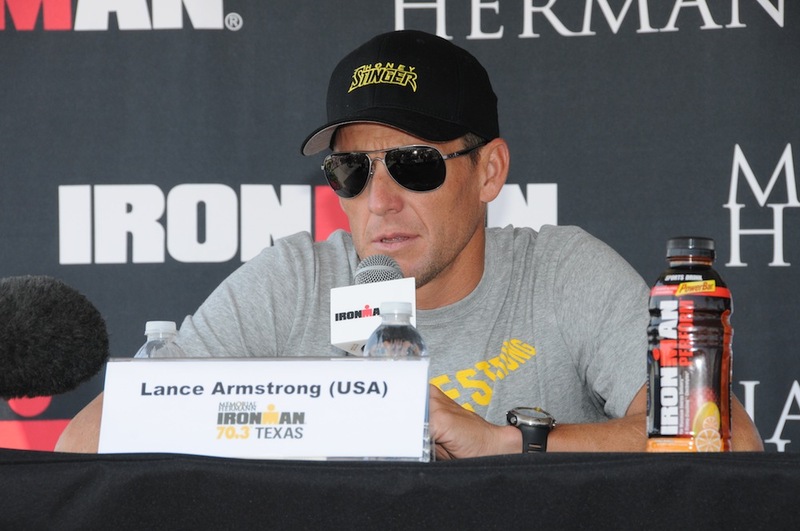 Lawsuits have piled up, sponsors bolted, and Lance even had to part ways with Livestrong. Since Armstrong can’t compete in sanctioned events, he’s not even allowed to enter triathlons, though Chris McCormack has challenged him to a one-on-one tri smackdown. FLORIDA CONNECTION: The Tampa-based World Triathlon Corp. trumpeted its partnership with Armstrong only to look foolish when he was charged with doping in 2012. So vast was Armstrong’s deception that we’re left to wonder if he even raced clean on the triathlon front and whether his Ironman 70.3 win in Haines City in 2012 was legitimate. Surely, he raced clean there, right? Oprah didn’t ask. No. 7 – NATIONAL EVENTS STRUGGLE IN FLORIDA: So often we see a national race promoter come to Florida and assume the masses will show up. After all, we have great year-round weather and hordes of athletes. Unfortunately, race promoters underestimate the number of established, affordable local events we have. Florida athletes are savvy customers with no patience for overpromising, overpricing, and underdelivering. That’s why it was no surprise that Competitor Group pulled its Rock ‘n’ Roll St. Pete event after another disappointing turnout in January. Tough Mudder, which had a traffic-related debacle in Sarasota in December of 2012, saw attendance plunge for events in Homestead (March) and Palatka (May). Even Spartan Race officials, who never seem to back down from a challenge, quietly canceled a proposed Spartan Beast event at Little Everglades Ranch for 2014. Ironman continues to sell out its Ironman Florida race in Panama City in a matter of minutes a year in advance, though that’s essentially a home event for the Tampa-based WTC. Warning to out-of-state promoters: Past performance elsewhere does not guarantee future return here and promoters can and do lose money. Paddlers compete at Benderson Park in Sarasota in August. No. 6 – SUP — UP AND UP: You know a sport is thriving when it seems every interview with a 24-year-old actress/model/singer mentions how she recently discovered stand-up paddleboarding. 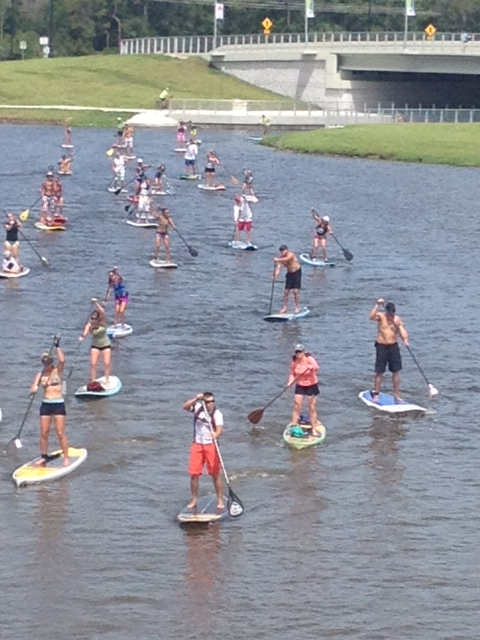 SUP has become the new yoga or Pilates, which makes sense since it works the body in a similar fashion and there’s now a cottage industry of SUP/yoga and SUP/Pilates classes. Surf Expo, which comes to the Orange County Convention Center each January and September, might as well be called SUP Expo. SUP board manufacturers have taken over the OCCC floor and the Thursday board demo day at a nearby watersports facility has become a highlight of the event for many. FLORIDA CONNECTION: Besides SUP, er, Surf Expo in Orlando, the Florida Cup has become one of the sport’s premier events after just two years. St. Pete lawyer and avid paddler Bruce Denson has built a late May weekend event in Pinellas County that belongs in the same discussion as the Carolina Cup and perhaps one day soon the Battle of the Paddle in California. The Miramar Beach-based YOLO Board has become a major player in the competitive board manufacturing industry. Then there’s Dunedin’s Karen Mirlenbrink, who is a YOLO Board athlete, a race promoter (Shark Bite Challenge), and a SUP Pilates instructor — basically the Queen of all SUP. No.5 – THE SPORT OF FITNESS: CrossFit and endurance sports traditionally were polar opposites. CrossFit tended to attract the gym rat demographic while runners never touched the weights. But once Spartan Race and Tough Mudder began actively courting the CrossFit crowd in 2011, the two met in the middle. You’ll still see groups from CrossFit boxes tackle obstacle races, though these days you’re more likely to see them enter CrossFit-style competitions or hybrid events such as the Pump N Run, a Tampa event (above) where athletes bench-pressed all of most of their weight and based on their performance deducted time from a subsequent 5K run. We’re not sure where all this is evolving, but it’s an interesting trend to watch. 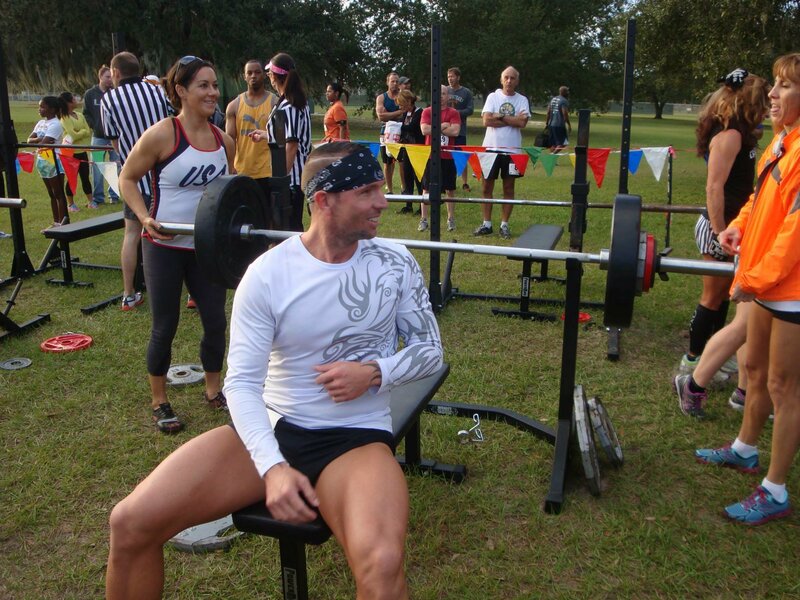 FLORIDA CONNECTION: In addition to the Tampa Pump N Run, hosted by Tampa trainer Whit Lasseter in November, CrossFit box owners Clint and Maci Lowery stage regular obstacle races from their Sweat Factory facility in Minneola (near Clermont), which is adjacent to a running trail. No. 4 – MARKET SATURATION – Back in 2005-07, we hosted a Friday afternoon fitness radio show that featured a brief segment previewing the weekend’s endurance events in Central Florida. The segment took about five minutes. These days it no doubt could fill a half hour and not just because of SUP races, obstacle events, and theme runs that didn’t exist back then. The number of triathlons and road running events has perhaps quadrupled and while that’s generally a good thing, it has diluted many races and created others hosted by organizers who have no business doing so. Triathlon seems to have peeked in popularity in 2011 after a decade of unbridled growth. Our theory is that some would-be triathletes instead turn to obstacle racing or CrossFit, where there’s no need to buy an expensive bike or learn to swim. But while there seems to be the same number of triathletes, there are more triathlons. As for running, it’s impossible in many markets to drive on a Saturday morning without being slowed by race road closures. What’s next? We’re guessing more road runners and obstacle racers will find the happy medium with trail running, which is easier on the body, generally offers a more pleasant race experience, and is often the best value in endurance sports. Which means, of course, that we’ll see a ton of trail races. FLORIDA CONNECTION: It seems like ages ago when the St. Anthony’s Triathlon in St. Petersburg sold out in a few hours in December. These days, it’s possible to register the day before the late-April event. This year St. Anthony’s is hoping to stop the attendance decline by offering a sprint distance to go with the traditional international race. No.3 – THEMES, THEMES, and MORE THEMES: We’re not sure if color runs, beer runs, zombie runs, and all of the rest are endurance events or merely festivals with jogging and walking involved. But there’s no denying the impact. The Color Run, which debuted in January 2012 with 6,000 runners in Phoenix is now partnered with sports colossus IMG and stages more than 100 runs annually worldwide. 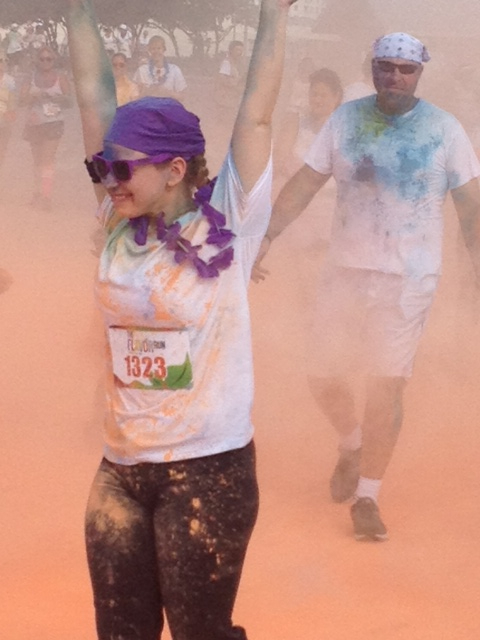 The untimed Color Run, in which white-clad runners pass through stations where they’re doused with colored powder, has inspired numerous knockoffs, including the Florida-based Flavor Run. Most athletes walk or slowly run the events, which are great fun for kids. FLORIDA CONNECTION: Like every other endurance sports category, Florida leads the nation in themed races. The Color Run alone has five Florida events scheduled in 2014 before Mother’s Day with more to come. No. 2 – OBSTACLE RACE SHAKEOUT – With a new obstacle race popping up seemingly ever week, it was only a matter of time before races started crashing in spectacular fashion. Mud runs have a bucket-list, post-the-Facebook-photo quality to them and events quickly have discovered it’s difficult to draw repeat customers. The zombie-themed Run for Your Lives endured the true death the day before Halloween. More surprising was the demise of Hero Rush, the Maryland-based, firefighter-themed obstacle race that we considered the best produced obstacle event of 2012. It flamed out in August, a victim of growing too big too fast. Who will survive? We’re betting on the races that position themselves as competitions rather than muddy office team-building exercises, which tend to attract the one-and-done crowd. 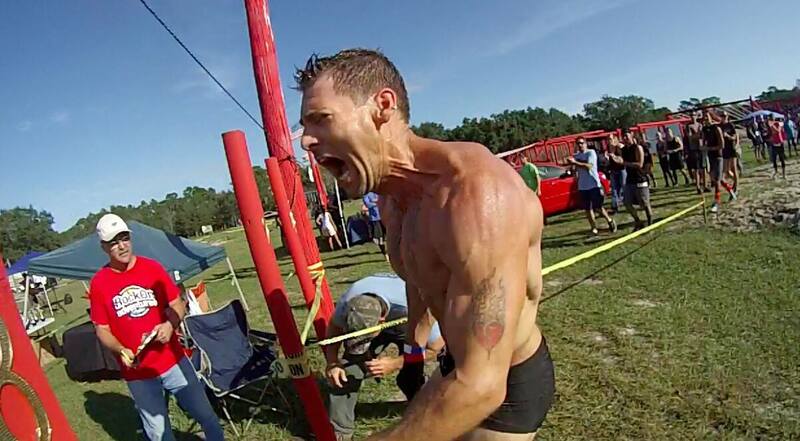 That’s why we’re bullish on events such as the Mile of Pain/Battle Dash, sort of an outdoor version of American Ninja Warrior produced by Central Florida’s Rock On Adventures. Ditto for Spartan Race, which still trails the untimed, team-oriented Tough Mudder in popularity. With Spartan’s every-athlete-for-himself (or herself) format, new national sponsors such as Reebok, a recent one-hour special on NBC Sports Network, and races of three distances that include events in sports venues, we’re betting on King Leonidas and the gang. FLORIDA CONNECTION: Hero Rush folded shortly before scheduled events in Ocala and South Florida. Through some poor scheduling (or perhaps intended) Tough Mudder and Spartan Race will go head to head in South Florida during the April 12-13, 2014 weekend. Spartan Race also brings its sports venue edition to Florida for the first time with a Spartan Sprint race at Tampa’s Raymond James Stadium in February. 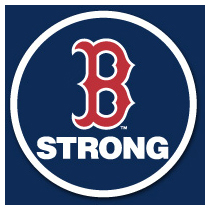 No.1 – BOSTON STRONG – The Boston Marathon was the biggest endurance sports story of the year for all the wrong reasons. Two pressure cooker bombs exploded near the finish line of the storied race on April 15, killing three people and injuring hundreds of others. The violence drew attention to the vulnerability of endurance events, which take place in wide-open settings, unlike sports competitions in enclosed venues. Runners and non-runners across the nation rallied to stage support runs and raise money for the victims. The Boston Red Sox surprising run to a World Series title further helped the healing process. FLORIDA CONNECTION: An FBI agent shot and killed Ibragim Todashev, a friend of suspected bomber Tamerlan Tsarnaev, in Todashev’s Orlando apartment in the early hours of May 22 after a violent confrontation. A Florida prosecutor is expected to release a report of his investigation into the shooting early next year. 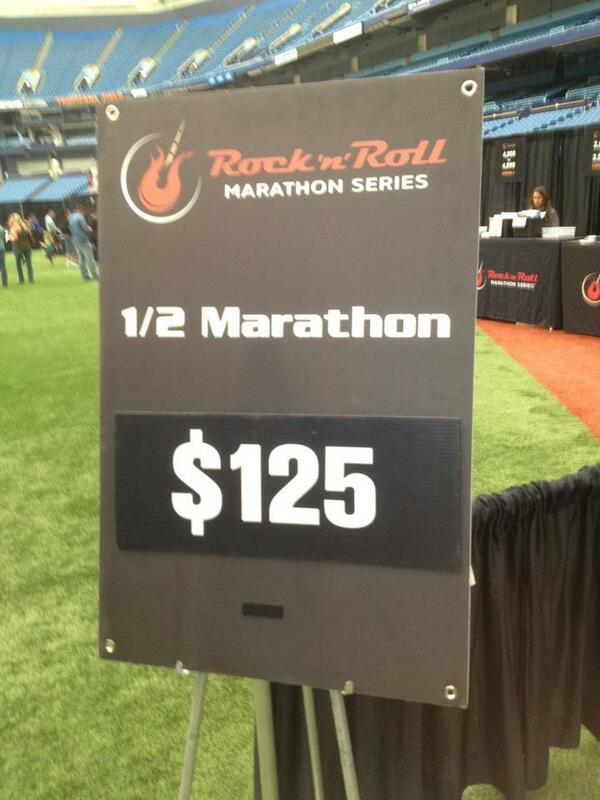 On a positive note, numerous Florida runners have qualified for the 2014 Boston Marathon, which promises to be the most watched, most secure marathon ever.